Kerolite or Cerolite is a metamorphic nickel bearing phyllosilicate mineral variety of talc, can be seen as a mixture of serpentine and saponite as well. It has the formula: (Mg, Ni)3Si4O10(OH)2·H2O. It is often considered as a talc variety and it was discredited 1979. 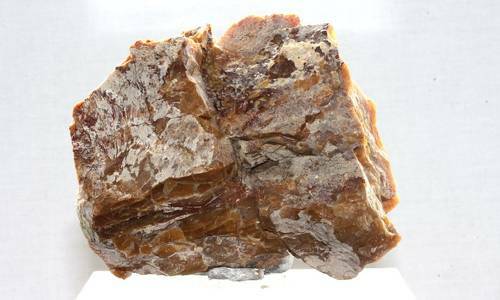 It is a metamorphic nickel-bearing phyllosilicate mineral similar to talc and serpentine. Kerolite is commonly considered to be of low-temperature origin; field evidence and the coliform texture support a deposition from colloidal suspension. Occurrence – It occurs generally in association with weathered ultramafic rocks as coatings and as veins filling cracks and often is intimately mixed with a poorly crystalline serpentine mineral. Kerolites from Goles Mountain (Yugoslavia), Wiry (Poland), Madison Co. (North Carolina), and Kremze (Czechoslovakia) are compared with talc and stevensite. 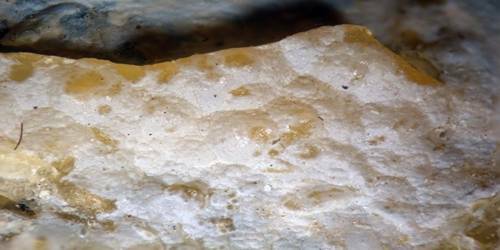 Kerolite is considered to be a useful varietal name for this talc-like mineral in agreement with the views of D’yakonov and of Maksimovic.